The beauty of a digital image is that you can make it any size you want. Thus this giant yummy confection!!!!! The little sprinkles are from the Dollar Store! Our theme for this week is Thanks. 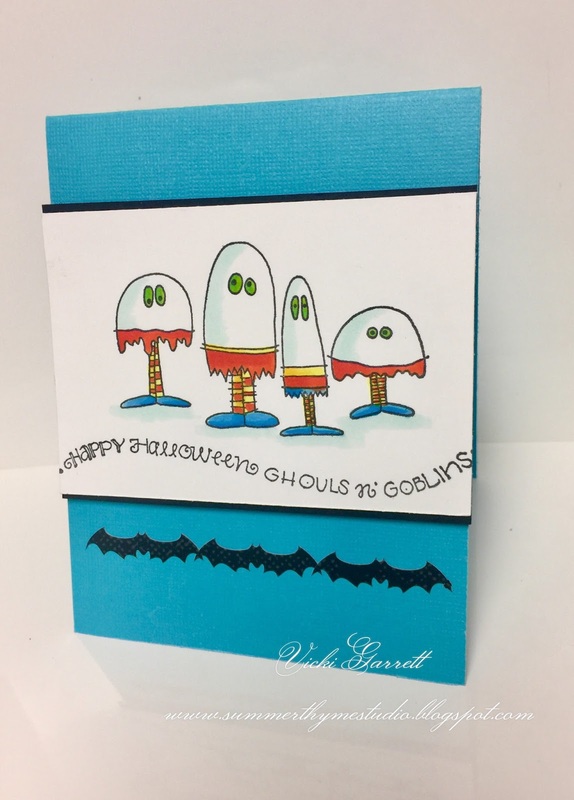 You can make a card with a Thankful theme. A thank you, Thanksgiving.....or just expressing Gratitude. 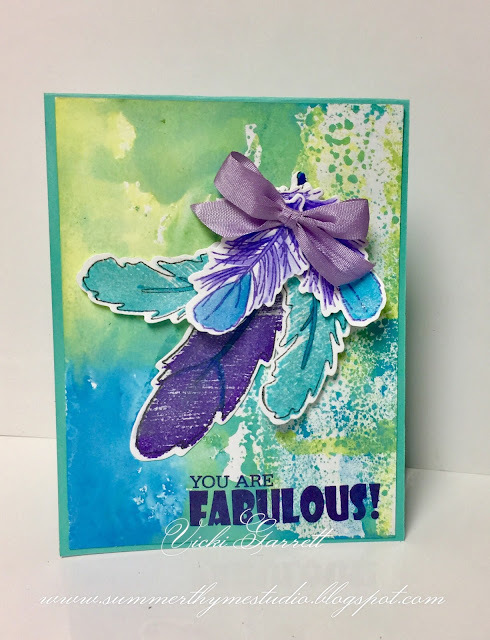 I stamped Feathers with the Elegant Feathers Set in Royal Purple, Aqua and Violet Ink. Then, I cut them out with the Elegant Feathers Die set. 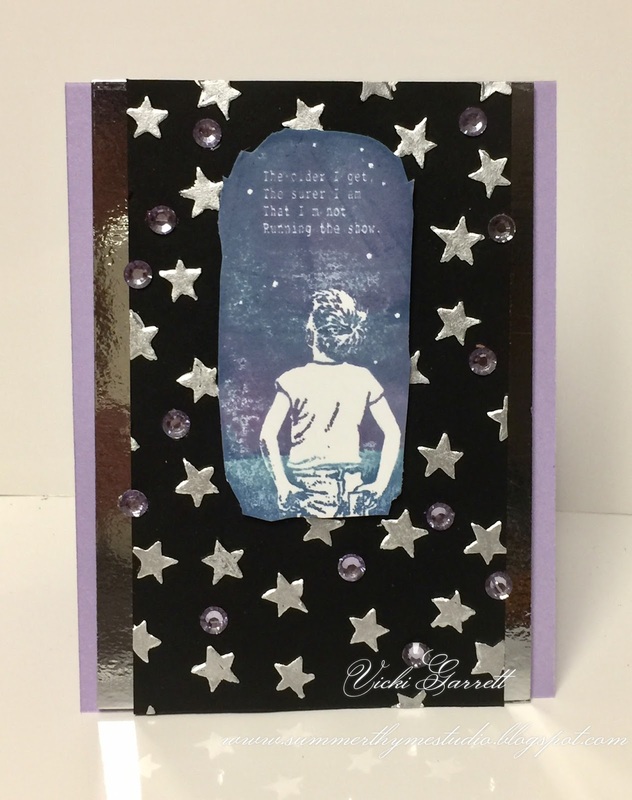 Lastly, I added the You are fabulous sentiment in Royal Purple. 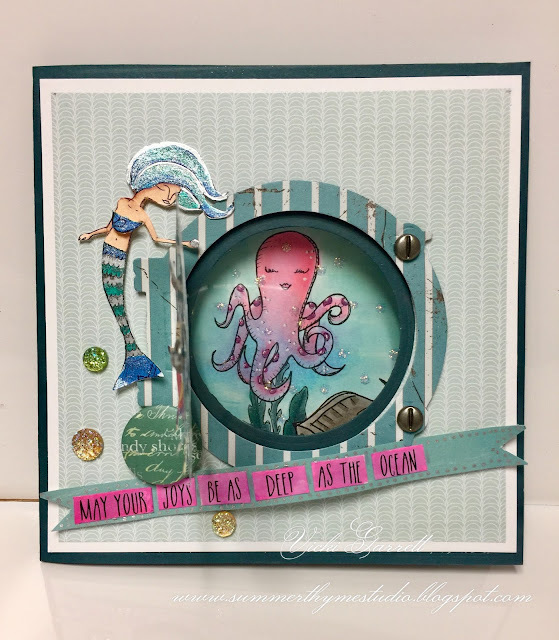 Make sure you head over to the IO Blog to get the details of the challenge and upload your entry for a chance to win a $25.00 gift certificate. I can't believe the week is half over!!! One day closer to the weekend!!!! You have until September 10th to enter. Winner will be announced September 11th. The challenge is... Bleach Blocking! For my first card, I only blocked one spot, but I used a paint brush to pain squiggles and dots in the bleach. I thought this would be a nice aquatic background for the Swirl Turtle and the Advice from a Sea Turtle sentiment! A quick and easy, but striking card!!!! I used much more blocking with this card (and a couple of flicks of the paintbrush for some extra splotchiness). 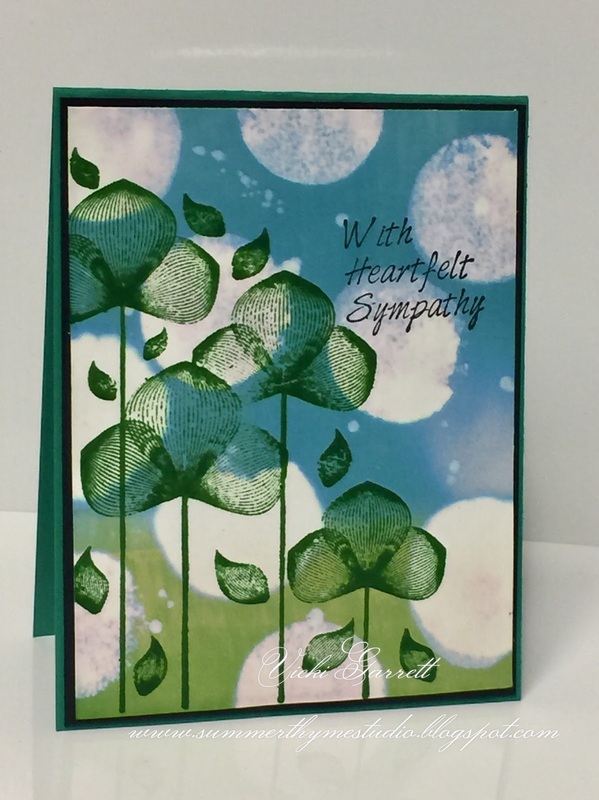 I used the Contemporary Floral stamp along with the sentiment from the With Sympathy set. Again, a quick and easy card. While I had the bleach out, I made a few more background to have at the ready when I want to make a quick and simple card. Good Morning! Hope you're enjoying a nice weekend. With having broke my knee cap, my summer's been a write off in terms of outdoor stuff, but that leaves me some more time to create! I'm getting along a little better, so I think I may venture out to the farmers market this morning and i'm going to try to drive the car this afternoon! 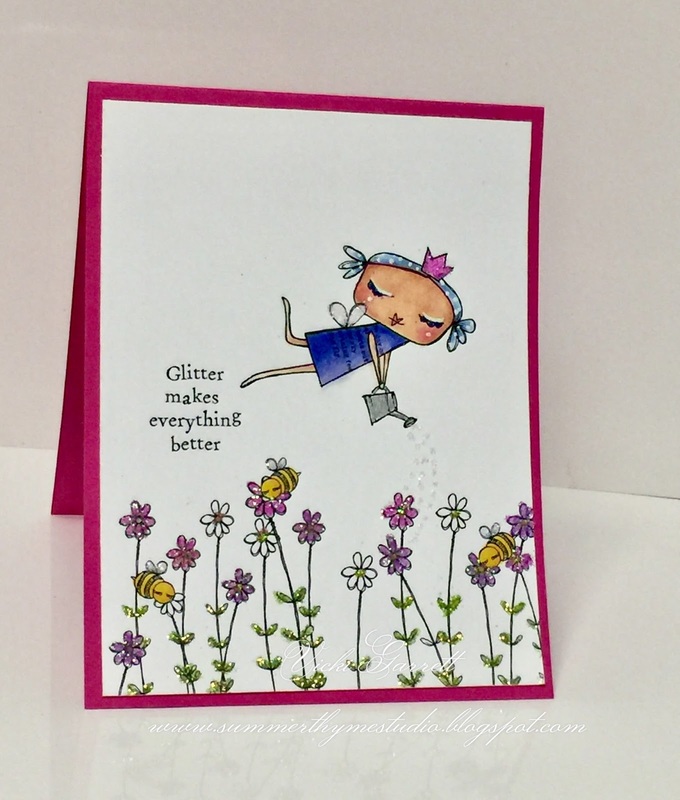 Today's my guest spot day over at Vera Lane Studio and I'm sharing two creations using her fabulous new release Sprinkle and Sparkle fairy sisters. They are just too cute! Bot images come with and without text, which makes them super fun!!! You can find the image HERE! I really LOVE the super cute bee!!!! Hope you have a most amazing day!!!! Going to keep things short and sweet this morning as i'm running late. Be sure to link up your colourful creations on the IO blog and visit to get all the details for winning a prize!!! Here's the list of Designer Players! 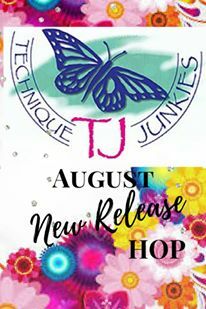 I wanted to share another newly released stamp from Technique Junkies Stamps! It took a bit of work to get this look, but it wasn't too taxing!!! First, I stamped the main image in Versamark and embossed in black. Pistachio, Broken China, Peeled Paint and Wilted Violet. I layed my Gothic Swirl Stencil over the panel and sprayed it with water. I lifted the stencil and gently dobbed the excess water off. Dobbed...is that a word? Well maybe dabbed.....dabbed, dobbed , wipe up the extra water already!!!! I heat set the panel and then using purple ink, stamped the image onto the background using my misti. Why did I use the MISTI you ask? Well, so I could stamp again with Versamark ink so I could then emboss it with clear embossing powder. Supah Cool!!!! Where did 21 years go? Jon is 21 today.......holy pete! I almost can't believe it. I wanted to make him a card that was reflective of something he likes to do, which is to fish. I coloured the image with Copic Marker, adding some ZIG Pen highlights to the metal areas. I achieved the vintage look by sponging over the entire image with Vintage Photo Distress Ink. As you can see, there's a little highlight in the middle. I eased up with the sponge there. Lastly, I used the Build your own Message set to add the sentiment. It really does pay to keep things around in case you need them. I've had these little metal numbers and letters from Making Memories for as long as I can remember. They were perfect to personalize the card even more!!!! I'm glad to say he liked it very much!!!! I created this card for My Great Uncle who is turning 92 later this month. Now that's a feat in itself! It's not to often one enjoys 92 years of living. He will have his 70th Anniversary next year!!! 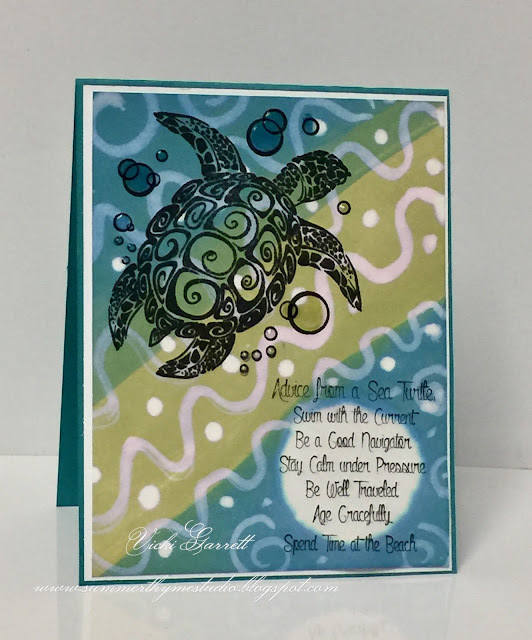 I took the opportunity to use my newly release Seth Apter images to created a fun background with the card. 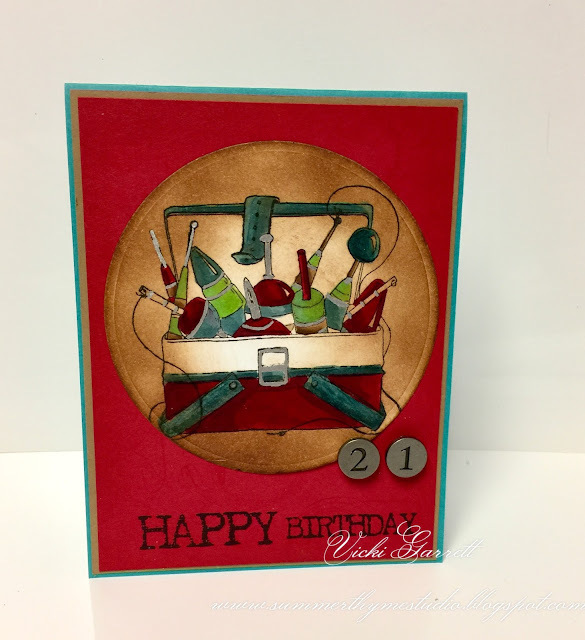 A quick and easy card, but quite striking I think! 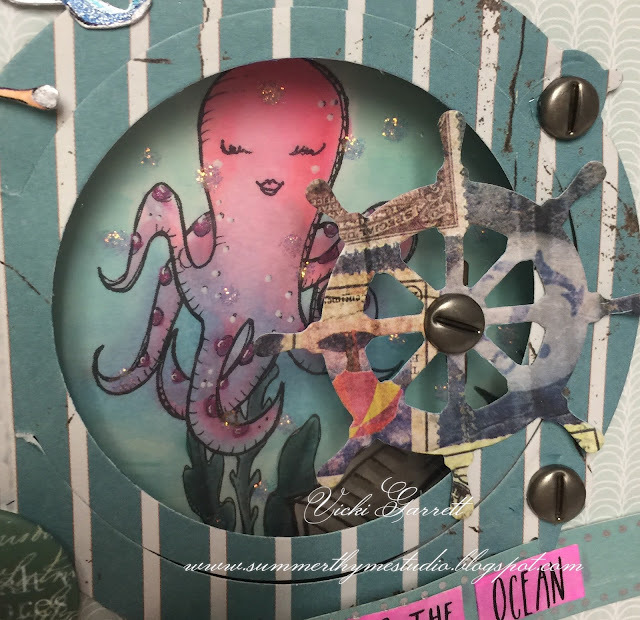 I'm excited to share this fun creation with you today!!!!! It's a sweet surprise in a card!!! I created this card using the Seahorse and Octupus and the Mermaid set from Vera Lane Studio Digitial Stamps. I love the possibilities you have with digi stamps. 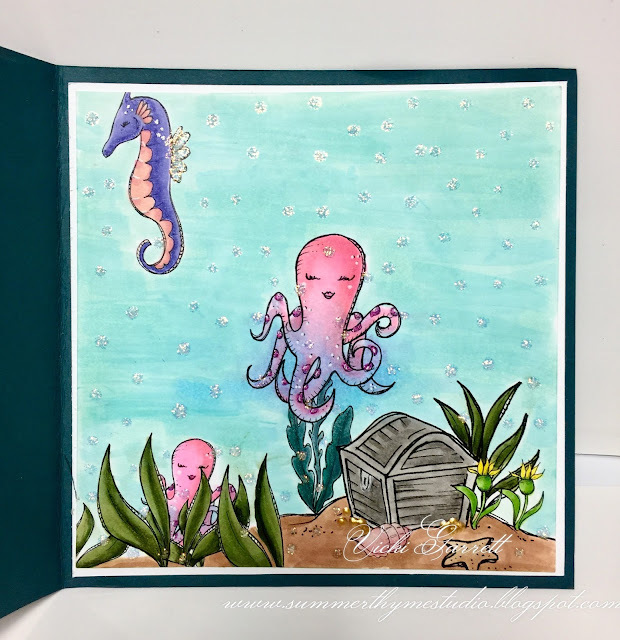 I coloured the images with Copic Markers, Nuvo Glitter Markers. I fussy cut the mermaid and sentiment. 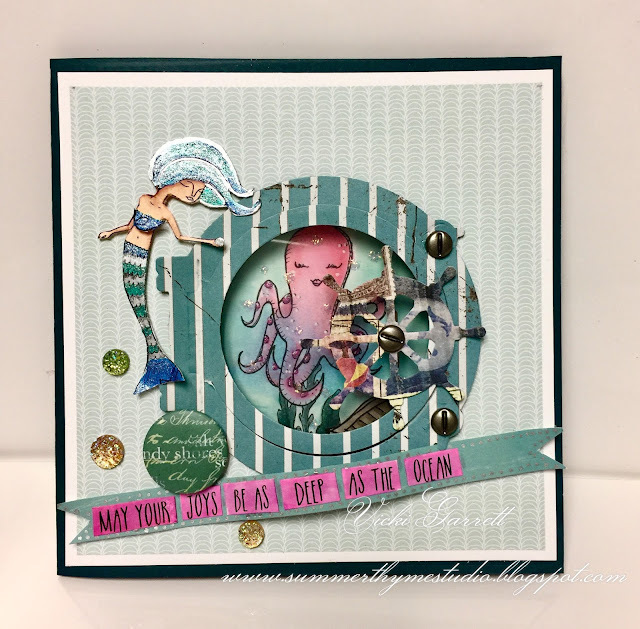 I have this super fun porthole die from Marianne Designs and I was just itching to create a fun scene with it. What about this cute little Octopus....... I love her little Octopus lips!!! Here's the surprise at the end!!!!! If you haven't, check out the Facebook group, it's a great group of people and you will be endlessly inspired!!!! Vicki here with your Saturday share. 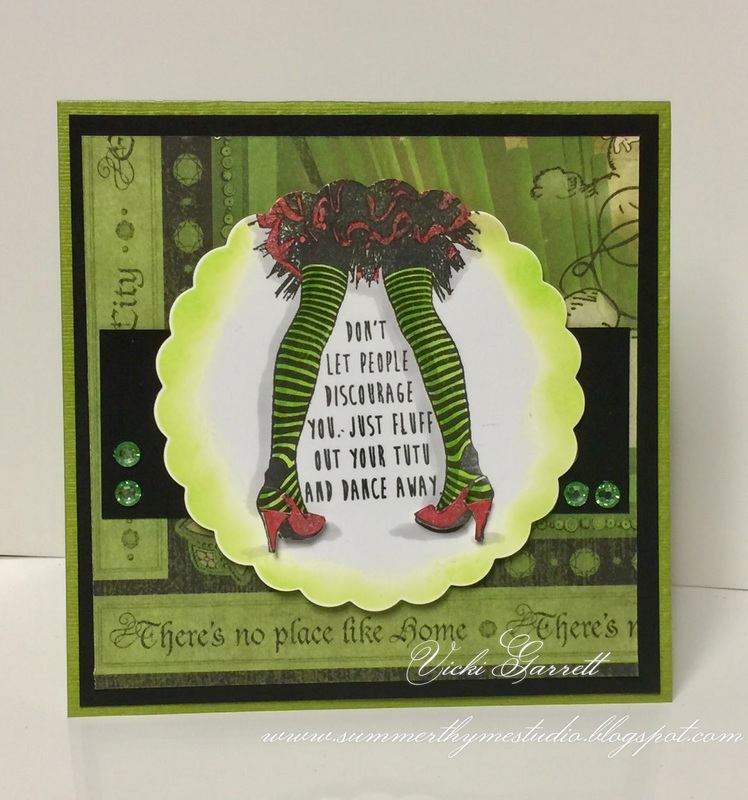 When I received this awesome stamp, the striped stockings made me think of the Wicked witch from the Wizard of Oz. Is it possible that the Ruby Slippers could have been Ruby High Heeled Pumps? In my imagination it is!! I coloured the image with Copic Markers and used the Red Pen from the Ember Glow Nuvo Glitter Markers to do the shoes and satin along the tutu! It's whimsical and well.......shouldn't life be like that. When people try to bring us down, it's important to keep on keeping on....dance to the beat of our own drum and if we have a tutu, fluff it up and dance!!!! I have had this Magic Oz paper from Graphic 45 for ages. I've actually hoarded it because I LOVE the Wizard of Oz and well, I just enjoy looking at the pretty paper. I decided to use a bit of it for this card, 'cause I thought it would be perfect!!!! Here's hoping you have a wonderful weekend. So what's up you say? I say I'm sooooo excited!!!!! 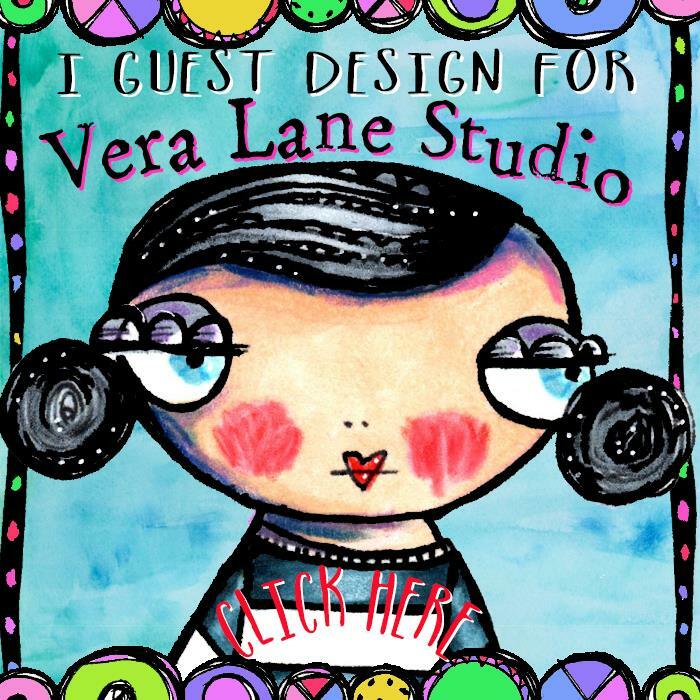 I've been given the opportunity to Guest Design for Vera Lane Studio Stamps this month!!! I first fell in love with Janet Klein's images when designing for Stampotique several years ago. 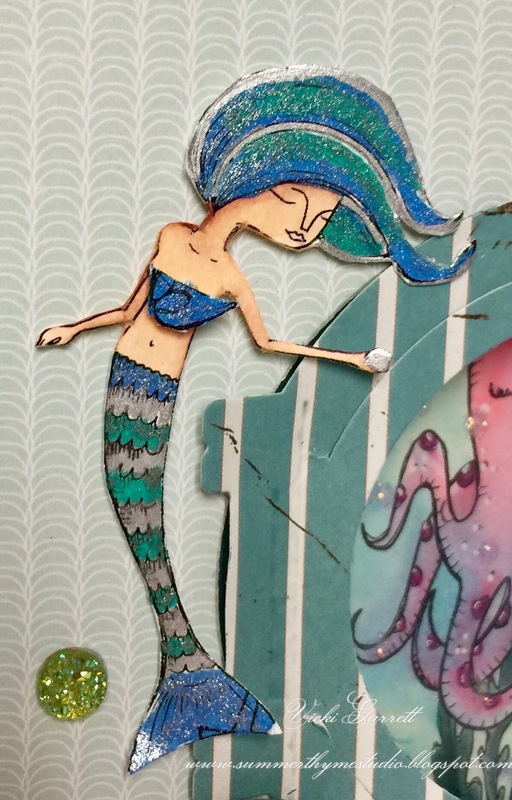 Her images are quirky, whimsical and oh so darned LOVEABLE!!! 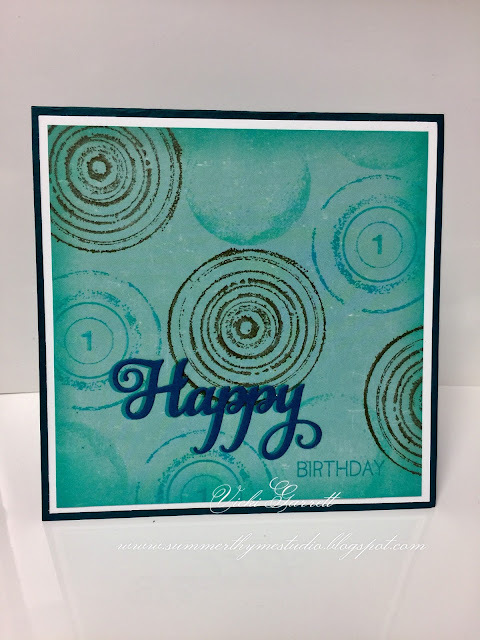 To make this, I went direct to paper with the ink and after lightly misting the stamp with water, I pressed it into the background, holding it down for a few seconds. I lifted the stamp and voila!!! Such a cool background. I cut the three words from the Kokeshi sentiment, which reads in full " Only from the heart, you can touch the sky". I added some Viva Decor Drops in Gold to the middle of the little blossoms and added some dashed of Pralines and Cream Glitter. 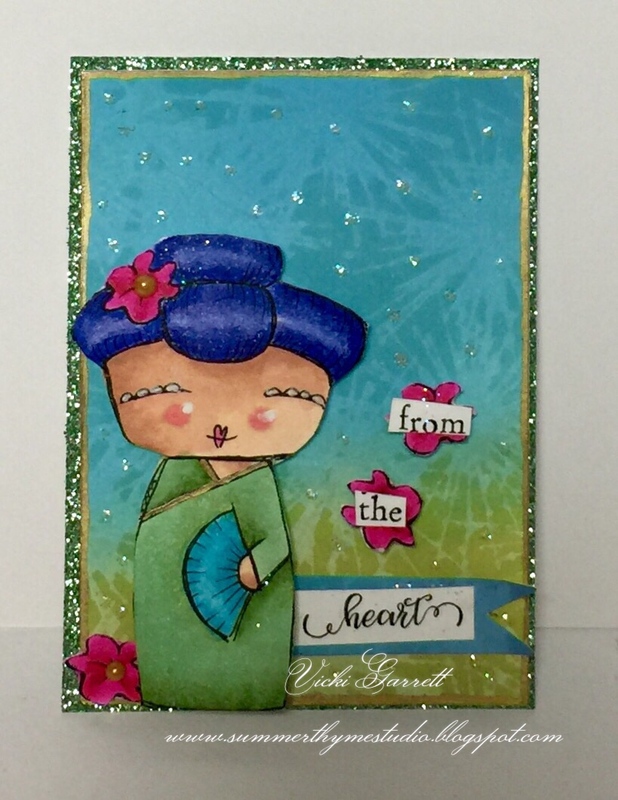 Oh yes, I used my Zig metallic pen to do the trim on her Kimono in Gold. Lastly, I mounted her image on Foam dots to the base and backed the image with some green glittery paper for some extra Pizzazle!!!! 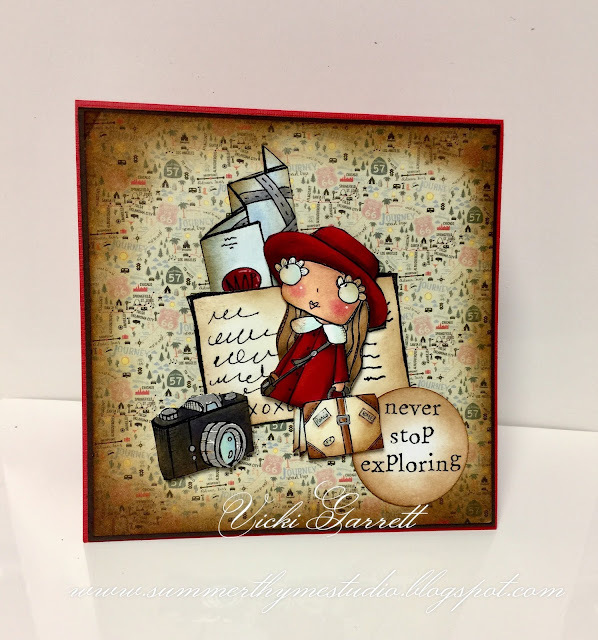 We have some super stamps to showcase this month, so let's get started!!! I love this stamp!!!! The sentiment is so true and I like the young lad staring up in wonder. Lastly, I mounted the layers onto shiny silver and then orchid coloured cardstock! 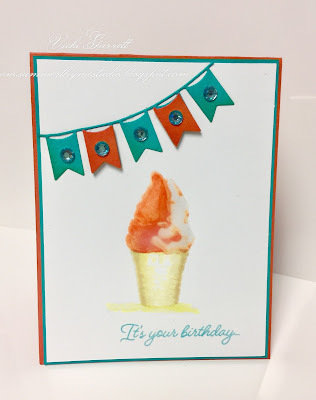 A quick and easy card, but I think it's pretty cool! I had brought some paint chips home to scope out some colours for a home design project. I didn't want them to go to waste, so I decided to turn this one into a card front. I heat embossed the whimsical image in white. 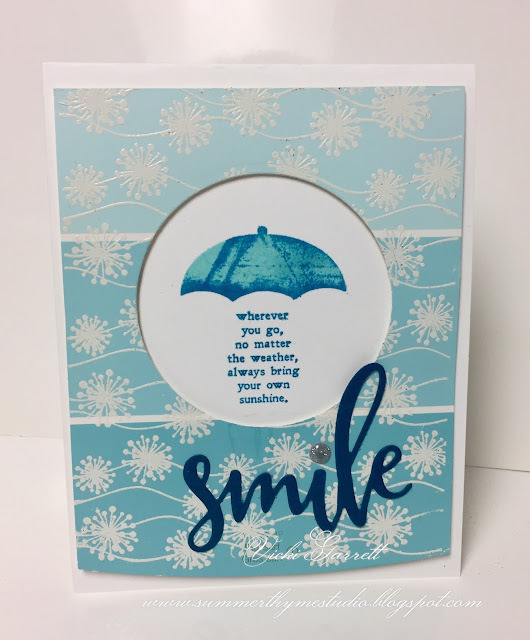 I decided to cut a hole from the middle and then used my misti to get variances of colour on the Bring your own Sunshine stamp. The Misti allowed me to easily leave the boots out of the image this time. 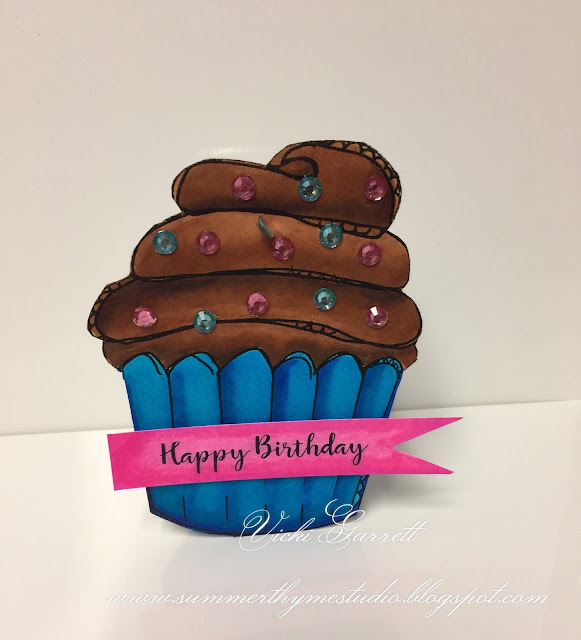 Lastly, I used a die cut sentiment, dotting the "I" with a little bling!!!! If you follow the links below, you can see all the great design team creations! 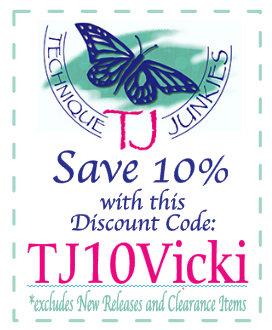 Be sure to leave comments on each blog for a chance to win some free Rubber! Remember, all of the August Release Stamps are 15% off through August 8th!